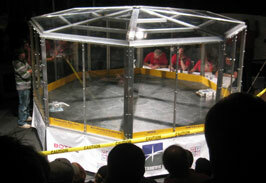 Bots IQ is robotics education program that is a spinoff from the popular BattleBots(R) TV show. Students build combat type robots and compete against other teams to see which team has designed and built the best product. This program is project based education. Students build a real working robot by putting science, technology, engineering and math into action. The construction of their bot also exposes them to many different advanced manufacturing careers. This program is helping to train tomorrow's workforce. Robot Construction: Usually between $500 - $1,500 for the components. Note that many of these components can be reused on subsequent Bots. Competitions: Local competitions usually have a modest registration fee (under $50). Regional and National competitions may have a higher registration fee plus your team will have the travel and lodging costs. Watch BotsIQ Wisconsin matches by clicking here.